The site for the London 2012 Olympic Games has been surrounded by almost 18 kilometers of blue plywood security fence since construction began in 2006. Since then, the fence has been interpreted as a political symbol of forced regeneration and forthcoming gentrification. Local communities feel excluded from the process of what will happen in the period after the Olympic Games. They feel excluded from participating, well illustrated by the impenetrable wall of blue. 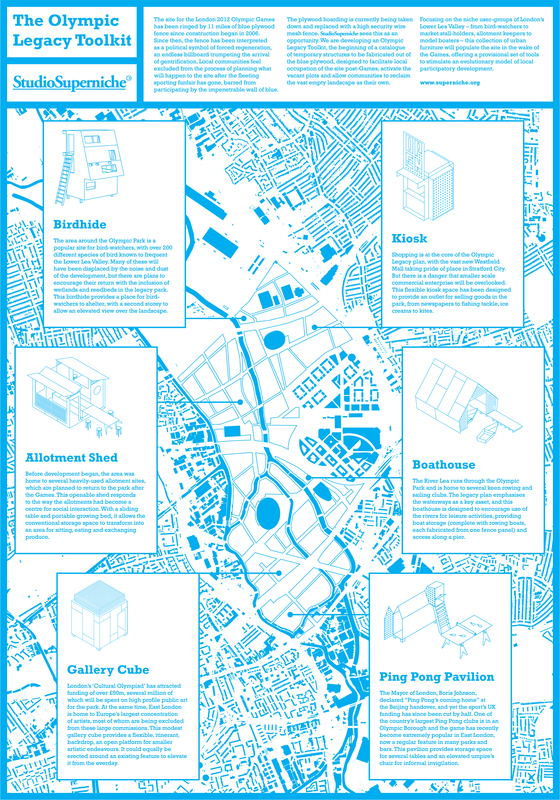 —Click here for a large version of the Olympic Legacy Toolkit. The blue plywood fence is currently being taken down and replaced with a high security wire fence. StudioSuperniche sees this as an opportunity. They have developed an Olympic Legacy Toolkit which stands for the beginning of a number of temporary structures to be fabricated out of the blue plywood fence. The structures are designed to facilitate local occupation of post-Olympic sites in a attempt to activate the vacant plots and allow communities to reclaim the vast empty landscape as their own. This insightful and creative project already won a special award on the Parallel Cases Biennale, initiated by the Rotterdam Academy of Architecture and Urban Design. Last summer we reported about the Flying Grass Carpet, the huge pop-up landscape entirely made of artificial grass. The project of our friends, Rotterdam-based architecture and design office HUNK-design and artist IDEddy has been travelling the world since. Colourful urban interventions are probably the best kind: they’re bright, they’re fun, and they’re wonderfully unconventional. We’ve written about painted bus loops in Bratislava and painted roadways in small Swiss villages before, but this one just takes the cake. American visual artist Jessica Stockholder (who was partially trained in Vancouver, I might add) brings us Color Jam, an art piece that will span hundreds of metres and be located on sidewalks, roadways, and the sides of buildings this Summer in Chicago.